I love when the most delicious recipes are also the easiest. Don’t you? Guys, weeknights are hard. I totally get it. This is my third week of being back to work full time, and every night when I come home, the idea of making dinner from scratch at 7 p.m. is…let’s just say…undesirable. It doesn’t help that I pass several restaurants on my walk home that I believe deliberately pump the delicious smells of bread baking and burgers grilling out onto the sidewalk so your stomach drags you inside *cough*SHAKESHACK*cough*. I have no real evidence of this besides my insane desire to purchase their wares every night. But it’s real. 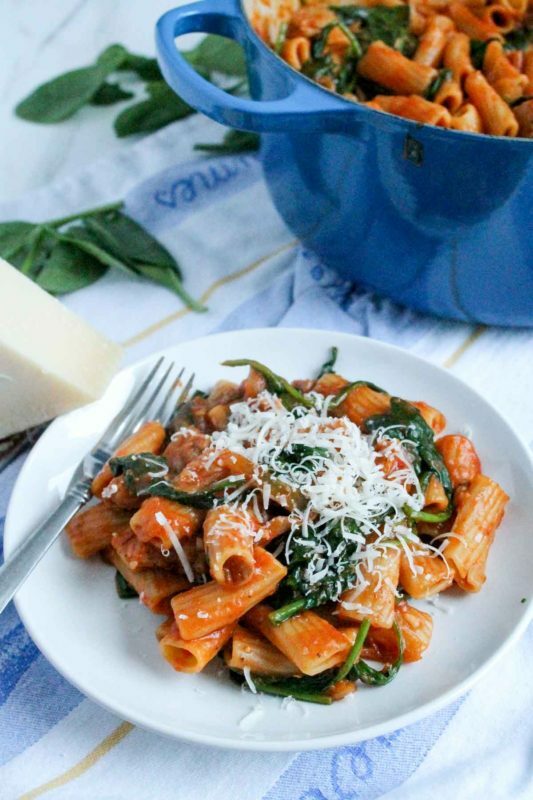 This is why I have invented meals like this One Pot Sausage Rigatoni – to keep myself (and you) from giving in to the siren song of Shake Shack, or whatever your particular Achilles heel of takeout is. I’m not going to lie and say this will take the same amount of time that it takes to wait in line while scrolling Instagram, buy your (ungodly delicious) burger and fries, and devour the same – it doesn’t. You need to be a fan of slightly delayed gratification for this — 40ish minutes — but gratification there will be. 1. Everything cooks in one pot, so you spend less time doing dishes and more time Netflixing after dinner. 2. Because the pasta is not drained, the sauce is starchy, salty, and rich, like restaurant pasta. 3. Best of all: for approximately the same price as that fancy burger and fries, you’ll have a huge pot of pasta that makes at least 6, if not 8 servings, depending on how hungry you are. WIN! On a weeknight, we’ll take all the wins we can get. 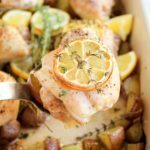 This checks all the boxes of a weeknight dinner for me: reasonably healthy, minimal ingredient list, 45 minutes or less to make, leftovers ready for tomorrow’s lunch. This way I have more time to make brownies – or Brian and I can have a glass of wine, binge Grace and Frankie or Silicon Valley until we pass out on the couch, and only have one pot sitting in the sink waiting to be washed. Isn’t my life exciting? 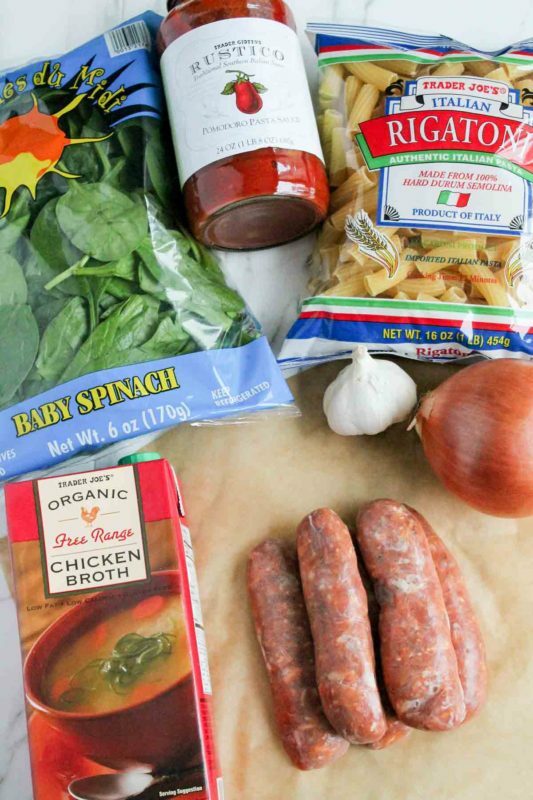 Here’s the sum total of our ingredient list: spicy Italian sausage, an onion (or a couple shallots), garlic, a jar of tomato sauce, chicken broth, fresh spinach, salt + pepper if necessary, and grated parmesan if you like it. I love being able to use up the entire contents of every ingredient, so that’s what we’re doing here. Full jar of tomato sauce, the whole bag of pasta and spinach, the entire onion. So. Satisfying. Start by cooking your onion, garlic, and sausage in a big pot or Dutch oven. Use whatever kind of sausage you like best – I used the Trader Joe’s Spicy Vino & Formaggio Chicken Sausage, because they annoyingly don’t have spicy Italian pork sausage. Whatever, it tastes delicious. 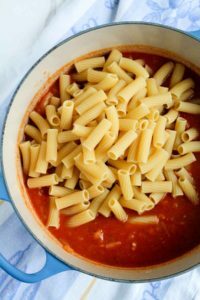 Once your meat is browned, add the pasta sauce and broth and bring it to a boil, then add the pasta and simmer it until the pasta is cooked in the sauce. I’d recommend grabbing a glass of wine during this time and stirring it every 3 or 4 minutes so it doesn’t stick to the bottom. 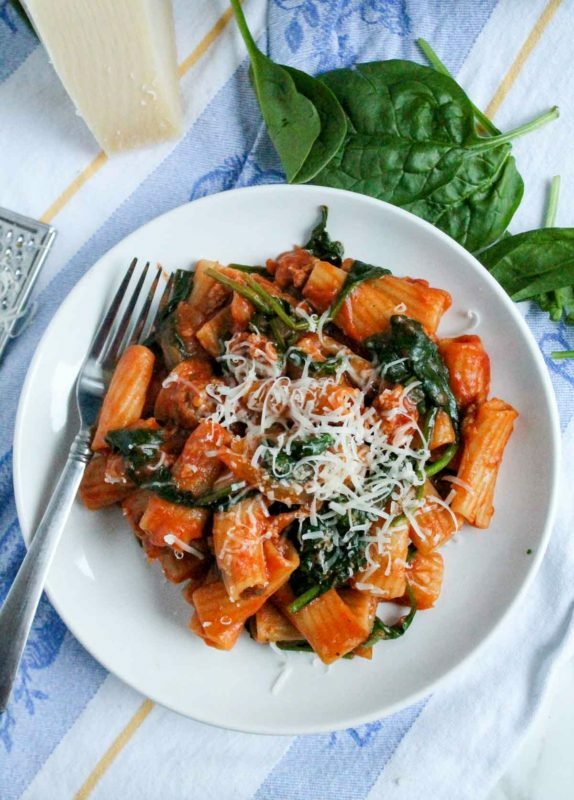 When the pasta is al dente (NOTE: you definitely need to taste it to check — it’s your duty as the cook, and it’s just happenstance that you’re also dying to dig in at this point), throw the whole bag of spinach in there, and patiently toss until it wilts. It’ll seem like way too much spinach, but trust me, it will cook down quick. You should be all done in a couple minutes. Now, taste your creation and make sure the salt/pepper ratio is to your liking. Then plate it up! Oh yes. It doesn’t get easier than this. 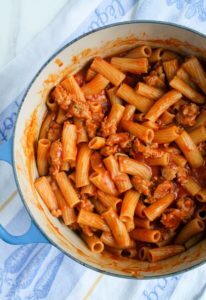 The sauce is rich and velvety from the broth and the starch of the pasta. I don’t know if the word umami has a place in Italian food, but this has totally got it. 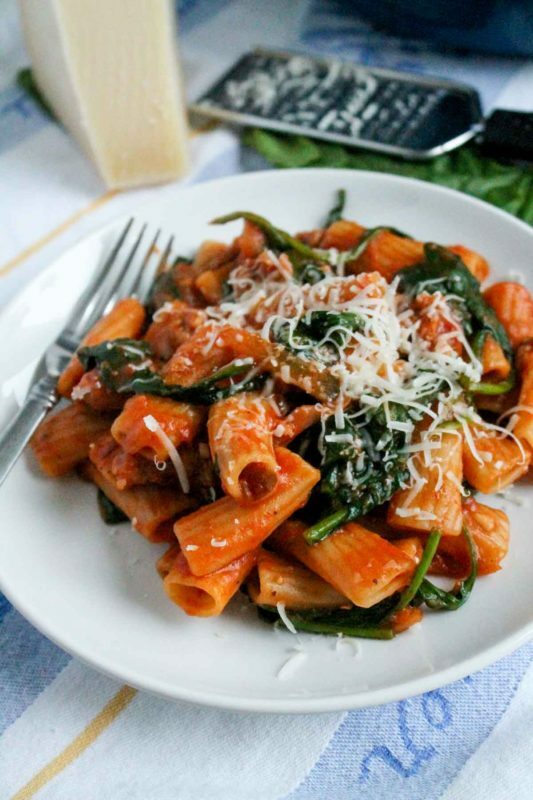 It’s just salty enough, and combined with the spicy sausage and the spinach, it’s a flavor bomb. Here’s a virtual high five because we just owned this Wednesday night! Nice job. It’s couch time. 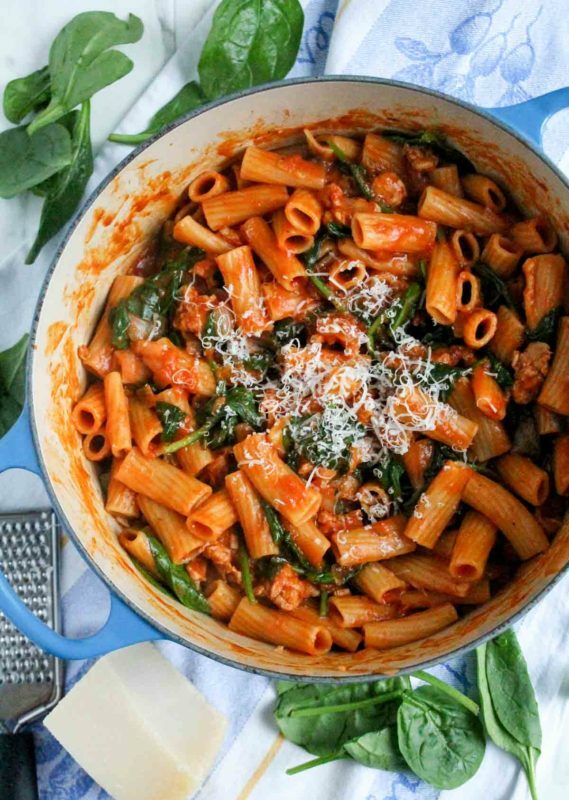 This one pot pasta is the perfect weeknight dinner - the pasta cooks in the sauce! Sausage, spinach, and onion make it a hearty meal, with a starchy sauce you won't forget. Heat a large pot or Dutch oven over medium heat. Melt butter and oil together, then cook onion and garlic until softened. Add the sausage and cook, breaking up with a spoon, until browned, 5-7 minutes. Add tomato sauce and chicken broth, and bring to a boil. Add the pasta and simmer, stirring every few minutes so it does not stick, until pasta is al dente, 15-20 minutes. Taste and add salt and pepper if necessary. 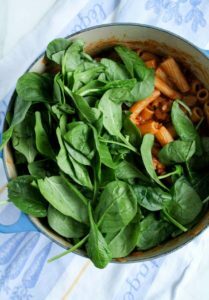 Add spinach and toss everything together until spinach is wilted (it will seem like a lot of spinach at first, but it will cook down!). Plate and top with grated parmesan if desired, and dig in! Just tried this recipe tonight. It really is quick, easy and delicious! I did have one question: In the picture of the ingredients, it shows a quart of chicken broth. The recipe, however, says 3 cups of broth. Was that a typo?? I found that it really needed at least 4 to be sure the pasta was cooked and that there was still enough sauce for the dish. 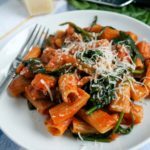 I happened to be using whole wheat penne so I am not sure if that made a difference. Thanks for another great recipe! Glad you enjoyed it!! It’s not a typo, I really do just use 3 cups of the broth (and use the remaining 1 cup for some other recipe later). I just took the picture with the unopened container. Using whole wheat pasta might make a difference though, and might explain why you needed 4 cups instead of 3. I haven’t tried it with whole wheat pasta so that’s good to know! Thanks for the feedback!